The Continental Cross Contact Winter MO tyre is designed for 4x4 vehicles that need a winter tyre that will perform no matter the weather. 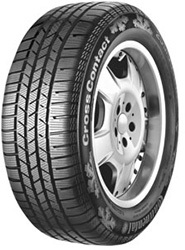 With excellent performance in the wet, snow and ice the Cross Contact Winter tyre really comes into play when the temperatures drop to below 7 degrees.A tyre that can be used all year round but is without doubt heads and shoulders above the competition within the winter months.If you are looking for a tyre that will perform and not let you down then the Continental Cross Contact Winter tyre is the one for you. The Cross Contact Winter MO tyre has been specifically designed for Mercedes vehicles.